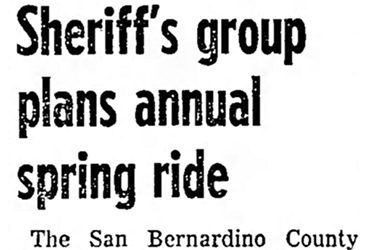 The San Bernardino County Sheriff’s Rangers will kick-off their annual spring ride May 13 in the Yucca Valley-Pioneertown area. This year’s four-day roundup will be headquartered at the Pioneertown rodeo arena. Featured activities will be horse racing, campfire gatherings and music from the days of the early west. 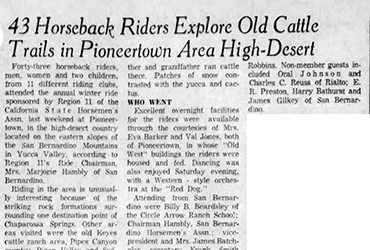 “cowpoke” who prefer not to toss their bedrolls on the ground will have the option of a room at the Pioneertown motel for a night’s snooze. 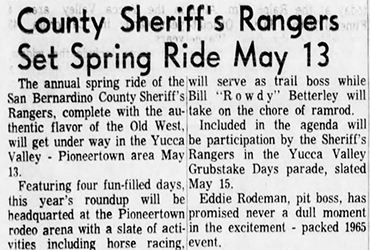 The program will include participation by the Sheriff’s Rangers, a group of riding enthusiasts, in the Yucca Valley Grubstake Days parade, scheduled for May 15.